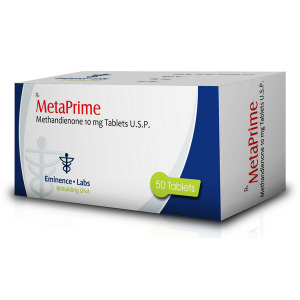 Metaprime 10mg Eminence Labs, has a pronounced anabolic and androgenic effects on the body. The increase in body weight and strength when using this steroid goes very fast. However, due to the strong androgenic component, there is also a strong water retention, which leaves after the end of the course. Thus, methandienone should not be used when working on the relief. But this steroid is simply indispensable in the period of gaining raw muscle mass. In addition, it contributes to a strong increase in appetite, and this is especially good when gaining weight. The range of dosages is the most varied (from a couple to 20-30 5mg tablets per day). However, the beginner should not cross the border of 30-40 mg per day, which corresponds to 6-8 5 mg tab per day. And in the first courses it is generally better to do 4-5 tabs at the peak. In this case, methandienone should not be used for more than 6-8 weeks in a row, because firstly, its effect on the body is reduced, and secondly, it will adversely affect the condition of the liver. The side effects of methandienone at the absence of any predispositions are usually weakly manifested at dosages of 20-25 mg / day. When these doses are exceeded, such phenomena as tingling in the right side (methandienone loads the liver), gynecomastia, as well as with a strong increase in body weight, increased pressure are possible. True, the rumors about the wild harmfulness of methane for the liver are greatly exaggerated, but still, even in the absence of pain in the right hypochondrium, it is advisable to drink hepatoprotectors such as Essentiale for several weeks after stopping the drug. Gynecomastia, when taking methandienone, usually occurs only in those cases when a large amount of this drug is taken (and in combination with other androgenic steroids), as well as with a corresponding susceptibility. Metaprime 10 mg Eminence Labs can greatly reduce the production of own testosterone, so upon completion of the course it is strongly recommended to use clomid. This drug allows you to restore the arc “hypothalamus-pituitary-testes,” and accordingly to establish the production of your own testosterone. It is also possible to beat gonadotropin for several weeks, but this is best done on a course in small doses (500 units every five days). Gonadotropin does not accelerate the recovery of the arc, it is used only to prevent atrophy (shrinkage) of the testicles on the course.